Fraser Stevens Learning | 11+ Exams Tuition - 11+ exams tuition and home based learning resources. Based in Berkhamsted, covering the Bucks region with our tuition classes. 11+ exams tuition and home based learning resources. Based in Berkhamsted, covering the Bucks region with our tuition classes. Thanks for all the fantastic material you've put together for the 11+. The work is really useful in focusing on exam technique with all the timed exercises. We came across your material while looking for tutors or study aids for our daughter, Arisa, in preparation for her 11+ examination. We were immediately impressed by the structure of the course and the fact that the students manage the course themselves - almost teach themselves to learn which is a great asset. The course didn't let us down and provided Arisa with 22 weeks of a variety of study aids, games, online tutoring, videos, etc. Arisa also found the Mock exams very useful and gave her an insight of what's ahead. This was definitely a very worthwhile, professional course which also cost a lot less than a tutor. The structure was excellent, knowing exactly what should be completed on a particular day is brilliant. The course gave a good structure allowing the wide range of content to be tackled easily in chunks. This stops the child from feeling overwhelmed and allows the parent to get involved if they wish on the topics that prove troublesome. It also gives you the confidence in knowing that everything that has to be covered will be by the end of the course. The mini tests each week allow a good check of understanding and start an awareness of test conditions and working to timings. The timetable over the summer holidays gives peace of mind. The mocks provide a realistic exam environment and the feedback afterwards is really helpful for fine tuning technique. And friendly advice and support all the way through! It was really fun and it really helped me pass! Although we didn’t have direct tutoring from FSL, you were always personally supportive when I emailed with a query, providing very sound and useful advice. Relaxed and informal approach by young and vibrant tutors. Small groups, but not too small. Easy to understand and well structured course work, especially the summer holiday timetable which was just the right amount of homework to rest time ratio so that the holidays weren't a constant battle! Really, I couldn't recommend FSL highly enough. The Comprehension Book is a fabulous resource and as a teacher myself, have found it easy to use with my own child. I liked that we did games. We learnt in a fun way. I made friends and the teachers were helpful. My son really enjoyed the weekly group sessions. His tutor was great. The summer pack was absolutely spot on. A personalised timetable for 4 of the 6 weeks and the work was completely manageable. He took the actual exam completely in his stride and I'm convinced that the preparation he did with FSL had a huge part to play. I would highly recommend FSL if the small group set up suits your child. I enjoyed the mocks because it gave us a sign of what to expect. Fantastic course with outstanding tutors, Liv is only sad she isn't going to see them all again - nothing to improve would recommend to all. (My child) liked the material, format of vocab etc and summer timetable was fantastic tool - took all the debate and pressure off us and struck right balance. The level of tuition was just right, and I noticed a huge improvement in my children's ability over the duration of the course, particularly in areas where they were not so confident. The summer coursework was personalised for each child, and wasn't too onerous, so never became too much of a chore. By the time the exam came around, I felt that my children were as well prepared as they could be, thanks to the tuition that they had received from Fraser Stevens. I've recommended Fraser Stevens to several friends who have younger children who plan to sit the 11+. Relaxed atmosphere, with kind teaching staff. Ciara never felt pressured, and looked forward to attending each week. Her course work was clearly set out, which encouraged her to self-manage what she had to do. Both (tutors) were extremely knowledgeable yet had a younger, friendlier attitude than your typical school teacher. My son didn't once complain about going to the weekly session and he complains about everything else! I have experience of other 11+ courses and this product is far superior. I always looked forward to my sessions because Kate played lots of fun games with us and didn't make it boring. I feel that I learned a lot not just for the 11+ but also for school. Both of my children thoroughly enjoyed the weekly group sessions. The course materials were excellent, and they liked having their own personalised timetables over the summer break. 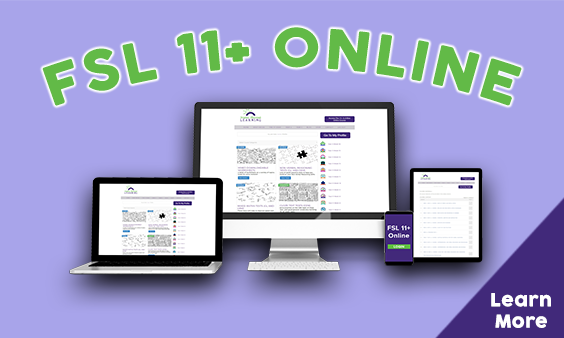 Who Created FSL 11+ Online?